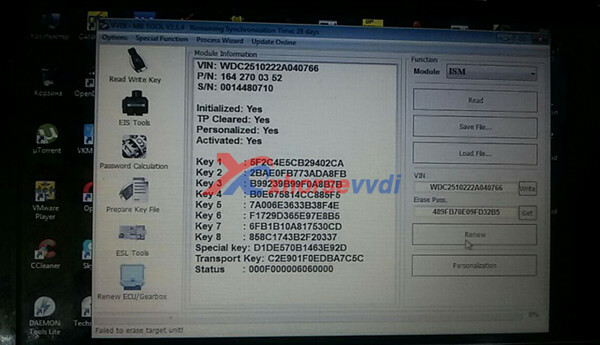 1.VVDI MB BGA Tool supports Benz key,read password and prepare new key via IR. 2.This SK185-B is only for Xhorse Condor Key Cutting Machine buyer.You can get one token free everyday. Why do you choose VVDI MB Tool(SK185-B)? 1.1. This VVDI MB Tool SK185-B is only for customer who had (Item NO.SL437 Condor Dolphin, or SL273-C Condor MINI PLus,or Item No.SL252 CONDOR XC-007 Master or Item No.SL273 IKeycutterCONDOR XC-MINI Master). And your Condor key cutting machine not bind with other VVDI MB Tool before. One Condor mini only bind with one VVDI Benz. 1.2. Please provide us your Condor Key Cutting Machine serial number when you place order. 1.3. After you receive package, please provide photo like following,and please put 3 items together in one pic:VVDI MB,Condor,Your Card. 3.Fastest Benz password calculation speed. 5.Support all key lost:W210,w204, w207,W166, W246, W212, W212(old),some W216, W164 2009- and some others. Future will add more. What is the difference of VVDI MB Tool (HKSK185) and VVD MB (HKSK185-B)? They are same functions,same outlook,package.Both of them can bind condor mini,condor dolphin,condor xc-007 to get one token free everyday. But if you have condor,or want to buy Condor mini plus vvdi mb tool bundle package,you can have discount price for VVDI MB Tool.And VVDI MB(SK185-B),you need bind OK,then add extra tokens. 2. Do you have see video of this tool They say can do all key lost on w212.No tool can do it even Mehaco or nec pro51. w212 eis on video, sure it can. Mehaco/Mercedes instrument can do all keys lost on w212.. the option is available a few months. 2.Q: I bought EIS W221 lock with a key from the lock from one machine. I have read the PSW. I will make a complete loss of W221 key in the future? 3.Q: I have a w204 All key lost and i program a new EIS with VVDI, the ignition doesn't come on or crank, but the steering can lock and unlock. can someone guide me what to do? 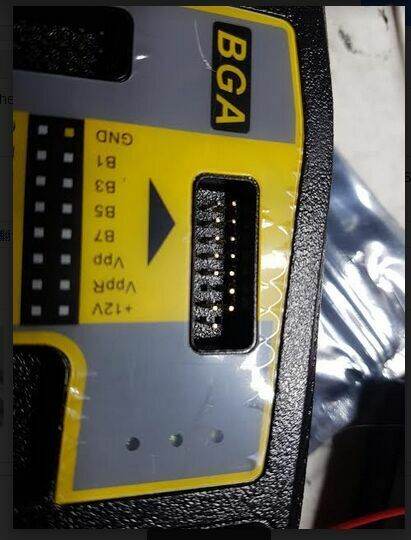 4.Q:Is there a way to delete used key with VVDI MB bga? A:Yes, VVDI MB TOOL support that! How to Update VVDI MB BGA Tool Software? Use “Menu ->Update Online->Software Update” to obtain VVDI-MB TOOL latest software version, the software version require firmware version etc. If there’s no display for software version, shutdown your firewall and antivirus programs, try again. 1.Q:Could anyone help me with bench test for w906? I can't find cable for this model. A:no need buy any cables for working via IR connect just 4 wires for working OBD need connect parallel any diagnostic to CAN and open EZS for testing connect emulator or ELV. 2.Use VVDI MB read S221 ISM Password successfully, but after click renew ISM,it shows "ISM-164 270 03 52(Siemens,VDO)"
A:For Renw ISM ECU function support list is much less,if after several time still failed, it may not support at present, please except future update. Thanks. 3.Q:What is the password of VVDI MB Tool?after i download it,extract it,it asks for password. A:The password is:123456.Same like VVDI Prog,VVDI2. 4.Q:I have received VVDI Benz,but the pins of 12V and 5V is missed,i checked the package box and insider not find them,what can i do? 5.Q:VVDI MB Tool standard version incudes tokens or not? A:VVDI MB Tool does not includes the tokens.If you have condor xc-mini or condor xc-007,bind them together you can get one token free everyday.Or you need to purchase extra tokens. 6.Q:Can i use MBE Engineering to program Xhorse Emulator? Q:NO,use VVDI MB to program xhorse Emulator. 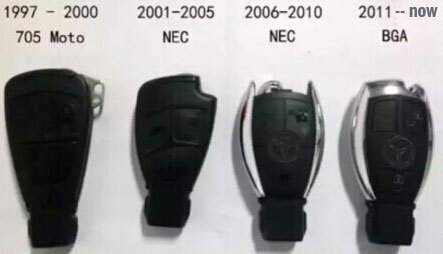 7.Q:I want to buy Benz keys to work with VVDI MB BGA Tool,before 2006 year and after 2010 Benz cars,do you have the keys? 8.Q:Will VVDI MB Tool always need new keys to program? A:It depends on your car model,some need new keys,some can program old keys. 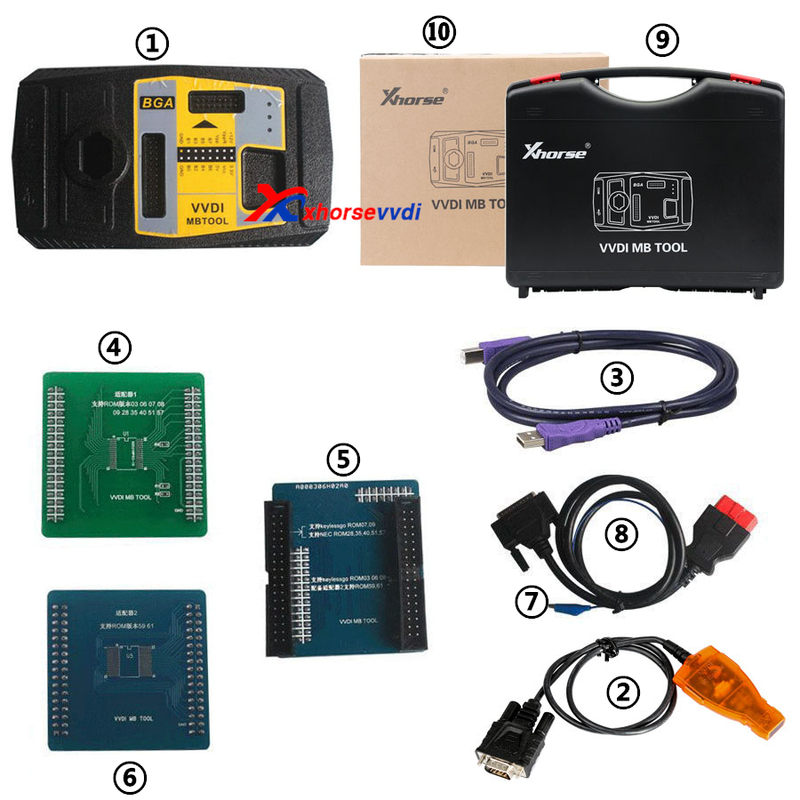 9.Q:How to connect VVDI MB Tool for writing diagram function?can i use VVDI MB Tool to copy old ecu data to new ecu? A:If it supports the function,it will show detailed steps. 10.Q:How to use VVDI Benz to read data? A:Usually,it can be read by OBD way.Sometimes,needs to read from EIS. 11.Q:Can i use VVDI MB TOOL to renew BGA keys?How can i get the key password? A:You can get the password from EIS data and key data calculate online.But BGA key does not support renew at present. 12.Q:Will it support 2016 FBS3 keys? A:No,it can not support at present. 13.Q:How can i get the erase password for EIS? A:It the EIS support renew,it will show the erase password. 14.Q:From the manual,it shows:Support renew EIS, make 2nd hand EIS to new one (online).What is the online meaning? A:It means you need to use VVDI MB Tool with internet. 15.Q:When i try to use password calculation to get key password,but it shows "pay for password culculation before update",how can i do? 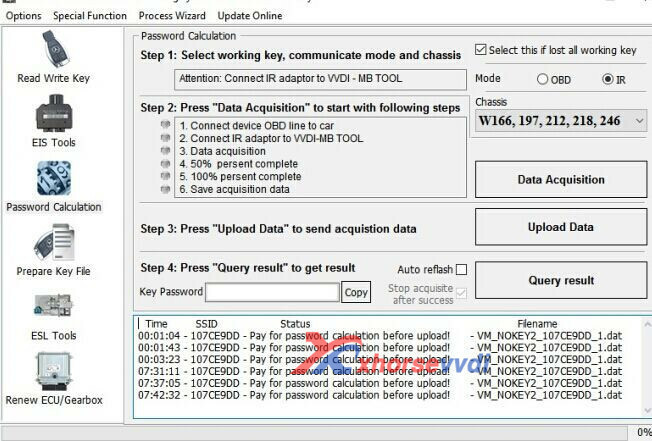 A:For password calculation function need tokens,if you do not have free tokens,you need to buy VVDI MB Tool Password Tokens. 16.Q:How many Password Calculation Token will be used everytime?One time one token? A:If all key lost,will need 2 tokens.Sometimes,the key is different,the token times may be different. 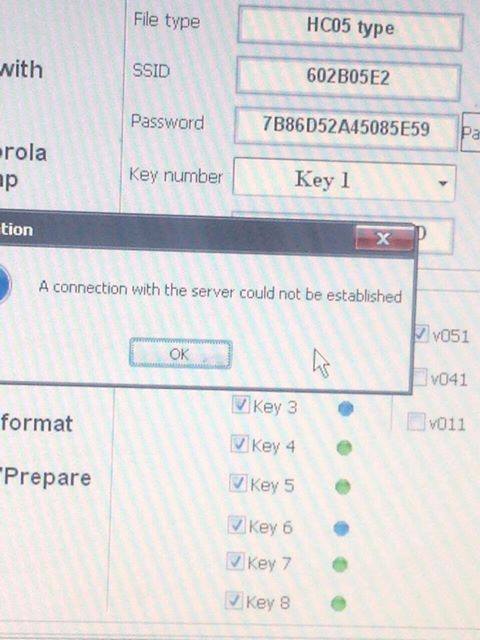 17.Q:When i try to use VVDI MB,but it shows Cannot connect to server,connection with the server could not be established,how to solve it? A:Vvdi Mb Bga tool Server Update which happened 11:00 PM China time, server was updated successfully all OK.Please try later.Thanks. 18.Q:Will VVDI mb bga tool renew Mercedes 7G gearbox 7G TCU 722.8? A:Yes. 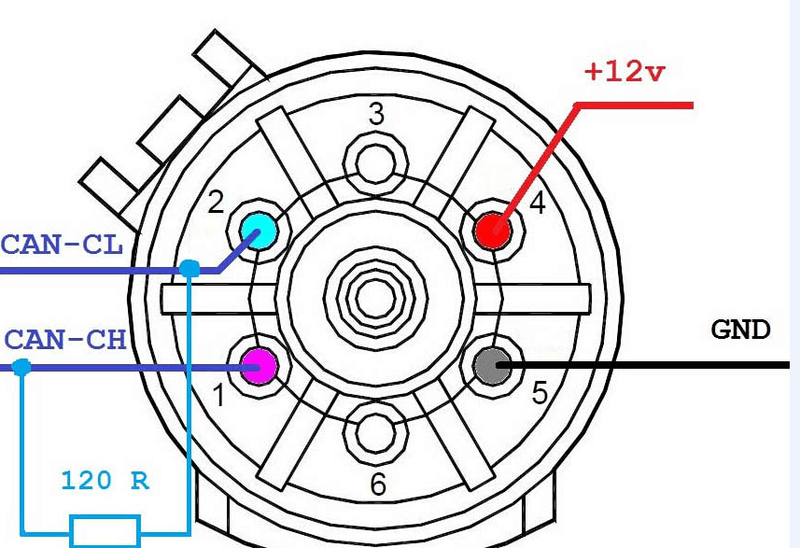 VVDI MB can renew MB 7G transmission. 19.Q:Today i had W210 2001 for key.Owner had one working key.VVDI MB tool try to read via IR and OBD password on car,unsuccesfull. Tried to read via IR and OBD on desk unsuccesfull. A:Remove 705 mcu on ETL and generate keys NoImmo online all ok.